SMITH BOYS ~ This is Deb, fearlessly flying solo on this latest literary mission because I want to boast about my boys. The Smith boys celebrated both a birthday and an anniversary on the exact same day last week, September 25th. It was my Sentinel writing partner Skyler’s 19th birthday, and I had proudly planned and presided over a surprise birthday dinner for him the night before. The other highlight of the week was that we had talked with our good friend Hilary Stott, who is one of Skyler’s biggest fans, and she was looking forward to hiring him for a job at Mendon 64 that would put him in Mendon with us every Saturday night! Moving on to my Smith Boy #2, my husband Smitty was invited back to Victor Central School where the athletic department had planned a special event commemorating the 40th anniversary of the boys varsity soccer program at the school. What would that have to do with Smitty, you may be asking? The answer would be that Tim Smith was the first boys varsity soccer coach at Victor. Earlier this season we had received notice that the school was planning a night to commemorate the 40th anniversary of Victor Varsity Boys Soccer and they asked if Smitty would be ready, willing and able to attend. Of course we responded in the affirmative, not only because we succinctly sense a story surreptitiously stalking behind every door, but more importantly Smitty was anxious to see his former student athletes from the earliest period of his teaching/coaching career. As we stare out over the beautiful lighted field in the gloaming of a glamorous early fall day in September, other advances are acknowledged. My husband makes the following observation while pointing out the protective cinder block structures under which both teams sit. “Check out those beautiful dugouts they have,” Smitty says, “our equivalent was that, back in the day, during our second year they bought us ponchos!” Everybody laughs. RESPLENDENT REUNION ~ So while there is some humorous commiseration over the past, the overall theme of the evening is one of a joyful reunion outstandingly accentuated by a halftime highlight. After the horn, Smitty and the returning members of the 1978 team are called out onto the field along the center line. The PA announcer provides a brief summary of the history of boys soccer in Victor for all in attendance. PONCHO PROCUREMENT ~ In processing everything the next day, Smitty recalls that he might still have an old bin of memorabilia from his Victor soccer days and the old rain poncho might be in it. After a serious search of our antiquated attic, the bin is located and the preserved poncho is procured for the picture you see here. 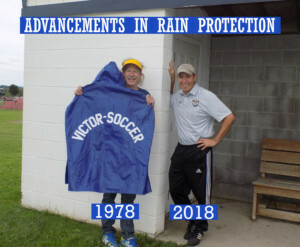 I subsequently set up this photo op to highlight the advances that have been made in the last 40 years in protecting players from the elements. Here you see current coach Steve Fish safely sheltered in his dugout flanked by past coach Tim Smith who is braving the elements with just his perilously paltry poncho. Back in the day, men were men.